Germany was the host of the FIFA World Cup in 2006 and minted the 100 Euro FIFA gold coin in order to commemorate this special occasion for a country and the honor of being the host of such an important event. Commemorating an event through the minting of a gold coin engraved in a way that suggests exactly the feeling of remembrance, is the best way to do it. The 100 Euro FIFA gold coin, weighs exactly 15.55 grams of gold or better said it weighs 1/2 troy ounces of pure gold and it has a diameter of 28 mm. One of the most important characteristic of this coin is its high purity of 99.90%, the equivalent of 24 carats. The letter J engraved on the reverse of the 100 Euro FIFA gold coin is the clue that indicates that these world championship commemorative coins have been minted in Hamburg. On the obverse of the 100 Euro FIFA gold coin is illustrated, in the center of the coin, a football field, as expected. The beautiful part of this field engraved in gold is that it has in the center a football ball which surely gives it a special touch. 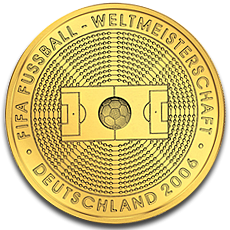 The inscriptions present on the obverse are FIFA FUSSBALL WELTMEISTERSCHAFT, DEUTSCHLAND 2006. The reverse of the 100 Euro FIFA gold coin illustrates the German eagle, the face value of the coin of 100 EURO, and the inscription BUNDESREPUBLIK DEUTSCHLAND. What I am going to write it is naturally understood but there is no harm in writing it after all. FIFA is a world championship that draws the attention of everyone, whether an individual is a crazy lover of football or just someone that likes to watch a beautiful fight on the field. No one misses the final match and until then everyone is making predictions on what team is going to win. Therefore, the 100 Euro FIFA gold coin is surely to raise interest in anyone but especially to real football lovers. It makes it even more special if a person has been a spectator and wants to remember those times. And gold in the form of the 100 Euro FIFA gold coin is the best way to do that. Maybe a football supporter will not see in this German gold coin minted in 2006 the qualities observed by an investor, like: the high purity of the gold used in minting these coins, the value of gold that is likely to increase in the future, the fact that in the future the demand for this particular coin may increase making it to be sold at a higher premium, and the fact that it has an intrinsic value that is not influenced by inflation or by currency devaluation. However, as time passes by, every investor will recognize the value of the 100 Euro FIFA gold coin. Collectors, football lovers, and investors should hurry and acquire the 100 Euro FIFA gold coin which was minted in the limited number of 70,000 gold coins and is available on our website.